Samos Our first impressions of Greece were coloured by the fact we arrived from Turkey on a Sunday. In Greece, well in Samos at least, everything is closed on Sunday. We also discovered that the next day was White Monday, a holiday. Turns out, everything is closed on holidays as well. We considered getting out of Samos as quickly as possible – likely to one of the more touristy islands where hopefully White Monday wouldn’t have the same effect, but we had already booked a hotel and left our passports with the manager while he was preparing the room so we considered ourselves pretty much stuck. This turned out not to be such a bad thing, for when we got into our room it was amazing, there was: a fridge, cups, cupboards, air-conditioning, clean sheets, no bugs, an ensuite, and a table by our shuttered window that overlooked our quiet street. In the end, we decided to spend 3 nights in this fabulous room on this quiet little island. While in Samos we tried several times to rent a scooter. On the first day – White Monday – this turned out to be impossible because all the locals had rented bikes from the 2 places that were actually open and by 1:00 pm when we showed up there were no bikes left anyway. Not ones to get discouraged we trucked over to the bus station only to find that we had missed the last bus of the day (you have to remember, this is only about 2:00 pm and we had missed ALL the busses). Now, you may be wondering why it took us until 1:00 pm to start our day. I blame the “Music Club” from the night before. In order to avoid further disappointment we were at the scooter rental place bright and early the next day. “Yes, we do have a bike… can I see you license” said the scooter man, “Sure, here you go” said Jon, “Oh no, you don’t have a motorcycle license so you can’t rent this 50cc scooter” said the scooter man. Apparently you need a motorcycle licence to rent a scooter in Greece. With scooter disappointment number 2 under our belt we again rushed to the bus station and this time actually caught a bus to Pythagorio – that’s right, birth place of the famous mathematician, so for the rest of the day I sought out every triangle I could find and photographed it. 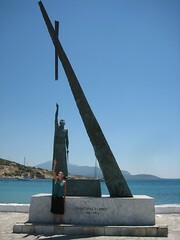 Most of these photos got cut, however, when we discovered a huge statue of Pythagoras and and a triangle on the port. Samos was a lovely island, it felt small, although it really isn’t small sizewise. The landscape looked more like Turkey than Greece, and there are no cubist Cycladic houses – likely because Samos isn’t in the Cyclades. In Samos (the town) you are in a Greek town, almost everyone at the restaurants is Greek, the cafes are full of Greek people and so are the shops (when they are open). Although this shouldn’t be shocking, as we are, in fact, in Greece, since we have left Samos most Greek people that we have met are in the tourist industry. Mykonos We only spent one night on Mykonos in transit to Ios and we have very differing views on the island – I thought it was expensive and not that nice, but I also found the town itself (the buildings not the scenic backdrop) the most beautiful we have seen yet. Unike Samos, this actually is a cubist Cycladic town. I do wonder, however, what is the big deal with Paradise Beach… chubby, old, naked men sprawled out on a pebbly shore packed to the brim with beach chairs is not necessarily my idea of paradise… but who am I to doubt the tastes of hundreds of thousands of tourists. Ios We knew Ios was going to be amazing when we stepped onto the ferry to get there. Our little catamaran called Flyingcat 4 was incredibly fast and sleek. We had decided to stay at a big campsite called “Far Out Beach Club” a huge place with campsites, permanent tents, bungalows, four pools, and beach chairs for 1 euro. They also had 2 for 5 euro daquiris. Yum. On our second day in Ios we ventured into town to do some errands, accordingly we were loaded down with books as we were desperately seeking out a book exchange. While looking for this elusive establishment (every English-reading tourist on the Greek Islands seems to prefer to buy a new trashy novel for 13 euros rather than frequent a book exchange) we stumbled across a huge street party… at 11 am. After a few moments hesitation we grabbed some beer from a mini-market and joined in the merriment. “When you have the choice to sit it out or dance” … (right dad?) This party turned out to be the Swedish Mid-Summer party, apparently the biggest party of the year. At about 2pm the music in town stopped and everyone paraded down the street down the street for three kilometres to our very own Far Out Beach Club where the party continued at least until 5:30pm when I wisely decided it was time to put myself down for a nap. The party picked back up at 2am, but I am embarrassed to say I bailed at 1:30… I was TIRED. Jon stayed out for an extra hour so he got a taste of the nightlife. I don’t want this talk of street parties to scare anyone away from Ios if that isn’t your scene. In my opinion the beach was the best we have seen in Greece. There are beautiful and relatively cheap boutique hotels overlooking the royal blue water. The island feels small, the local population is only about 2000 (I’m sure this quadruples in the summer when foreign staff manages the bar scene) and during the day (other than the street party day) the town is absolutely charming. Regardless of your demographic, you won’t be the only one there – this island is shared by families with small children, middle aged people, retirees, and the party crowd – and they all exist in peace, albeit on a different schedule. If you’re in the Greek islands wondering about whether you are allowed to rent a scooter, please refer to this comment.